Now that fall has officially arrived, it’s time to do some seasonal home improvements in order to prepare the home for the coming months’ cooler temperatures. Your door is the most underrated part of your home, but it plays a major role when it comes to improving its curb appeal. You can use it to improve the aesthetic appeal of your home and at the same time, protect the people inside. A door says a lot about the people who live inside those doors, which is why maintaining its upkeep is important. Don’t underestimate the power of having a strong, sturdy door, especially if you’re looking to increase the resale value of your home and thinking of selling it in the near future. In order to prep your door for winter, the first order of business is to do a visual inspection of it. One of the things you can do is to check if the door is sturdy enough to last in the coming months. Doors can be slammed too hard, and hinges may have loosened over the years and will need to be tightened. Homes, especially old ones, have a tendency to develop cracks and crevices around its doors. These openings could be the reason for artificially-produced heat to escape your home and make your HVAC system work doubly harder. The end result? Your energy bills become higher. From the inside, check the threshold under the door to see if the gap is too big that the air manages to come in quite easily. Any door leaks will allow the draft to come in, which will make your HVAC system work harder. This will result to higher heating and cooling bills. A door bottom may be installed to fill in the gap to help create an air tight fit. Caulk is great at sealing in unfilled gaps as well as cracks in the foundation of a building. It is also relatively inexpensive and effortless to apply. You can find one at your local home improvement store. 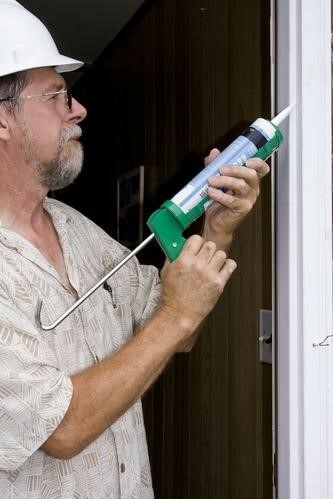 See if the existing caulk in your door has cracked or peeled away, and make sure to replace it if it’s already damaged. If the gap between the door and the wall sidings are about the size of the width of a nickel, then it’s time to replace the existing caulk. Weatherization is another great option when it comes to insulating your door against the winter months. Weather stripping is the process by which the air leaks in a house are sealed in. What makes weather stripping different from caulking is that the former seals in the cracks that would normally crop up around doors and windows. On the other hand, caulking is used to seal holes that are created by combining two different materials together. When implemented on a door together, caulking and weather stripping is a powerful combination that creates an airtight atmosphere for your home. Implementing weatherization techniques can help save you as much as 40% in your heating and cooling bills. Get rid of dirt and debris. Check for any dirt, dust, and debris that have accumulated over time in between the cracks of your doors. These things will only make it hard for you to close your doors properly. With a clean rag, wipe down these cracks to remove dirt. Replace the door if needed. If the caulk and weather stripping don’t do the trick, then you would have to seek a replacement for your door. Choose a door that reflects your personality as well as the overall décor theme of your house. Pick a door that will last you a long time. By preventing these tiny leaks through weatherization, your home becomes more energy-efficient and will save you money in the long run, as HVAC expenses account for almost half of your utility bills. The doors in your home will also be able to withstand the friction, foot traffic, extreme temperature changes, as well as the normal wear and tear process.